The 1913 Romanov Tercentenary Egg is made of gold, silver, portrait diamonds, rose-cut diamonds, turquoise, rock crystal, purpurine, translucent white enamel, opalescent white enamel and watercolor on ivory. The miniature globe is made of steel, varicolored gold and dark blue enamel. This Egg, one of fabergé's most astonishing pieces, commemorates 300 years of Romanov rule. 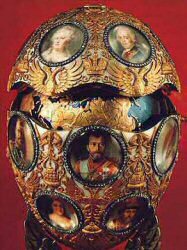 In 1913, the 300 year rule of Russia under the House of Romanov was recorded in the eighteen miniature portraits in eighteen round diamond frames, by Vassily Zuiev encircling the Tercentenary Egg, from the founder, Mikhail Fedorovich, to Catherine the Great, and Nicholas II himself. The white enameled shell of this Egg is nearly obscured by over eleven hundred diamonds and golden symbols of royal order. Inside, a globe of burnished steel inlaid in gold displays the frontiers of Russia in 1613 and the vastly extended borders of Russia under Nicholas II. The spaces between the portraits contain inlaid patterns of heraldic eagles, crowns, and Tsar's wreaths. A large diamond bearing the dates "1613" and "1913" is secured at the top of the egg, while a large triangular diamond fixed to the bottom end covers the monogram "A.F." The inside of the Egg is lined with opalescent enamel on a guilloche ground. 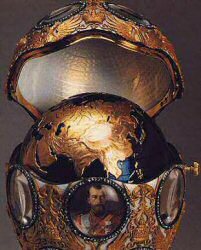 The surprise ia a rotating steel globe of dark blue enamel inside the Egg; it shows the territories of Russia in 1613 and 1913, represented in gold. The base is constructed of purpurine, decorated with small enamel patterns, and secured on three supports cast in the shape of flattened pellets. In 1913 as if saying a last farewell, Nicholas II and Alexandra Feodorovna made a pilgrimage in the tercentenary year, retracing the journey made by Michael Romanov on his way to the throne. 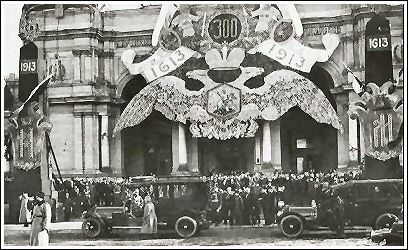 The celebrations across Russia were extravagant and, judging by photographs, well attended by the masses. The Imperial Couple completely misread the mood of the nation. Alexandra in particular would find it difficult to believe the events that would overwhelm them in just three years' time. She believed to the end that the Russian peasants worshipped Nicholas and herself. In its own way, the Egg indicates how little Russia had changed in 300 years under Romanov rule. 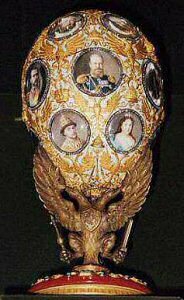 The Romanov Tercentenary Egg was never sold and is one of the ten Imperial Eggs in the Kremlin Armoury Museum in Moscow. 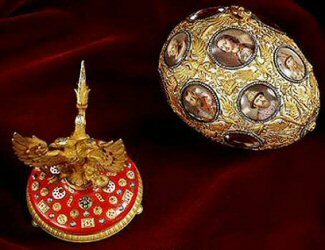 Here are the 18 miniature portraits of Romanov rulers depicted on the Romanov Tercentenary Egg. The only Tsar not present on the Egg is Ivan VI, who as a 2 month old baby officially was Tsar for a short time. He and his mother Anna however were overthrown and Elizaveta, daughter of Peter the Great was installed as Tsarina. Another person who perhaps should be in this list is Michael, the younger brother of Nicholas II. When Tsar Nicholas II abdicated in 1917, he did this in favor of his younger brother. Michael had the idle hopes that the Russian people would choose him as ruler, however after only one day, he too abdicated, and was never installed as Tsar. 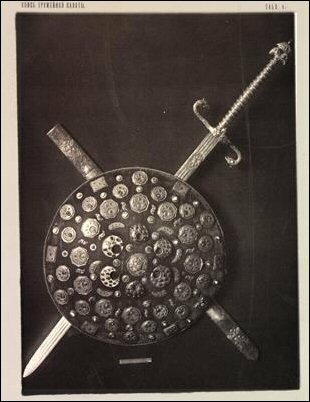 The base of the Egg, inspired on the 17th century State shield, collection The Armoury, Moscow Kremlin State Museum-Preserve of History and Culture..
Phototype "State sword with sheath and shield"